Outdoor signs are the face of a business. In fact, 79% of Americans remember an establishment based on its sign, making signage one of the most important ways companies bring in sales. Failing to properly maintain or replace a bad sign can have negative consequences for your establishment’s profits, growth, and customer satisfaction. Ragged or old-looking signs can make customers doubt the quality of your business, or even make them think that your business has closed. If you notice any of the following issues with your business’s sign, it might be time for a sign repair or even a replacement. If there are visible cracks or chunks missing from your sign, it’s time for a sign repair. 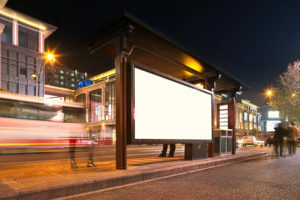 The sign company that installed your billboard or storefront name display should offer maintenance and repair services. Some cracks or breaks might be too serious for sign repair, but call a repair service for an estimate before purchasing a new sign altogether. If the lights in your digital or lighted electric sign are flickering, you might have a few loose bulbs or an electrical problem, like a weak or inadequate power source. Sign repair services can often fix flickering signs with relatively little effort, or make recommendations about how to connect the sign to a better power supply. A dimly-lit sign may not attract as many customers as a bright sign because it is less visible or seems less professional. If you think your electric sign could be brighter, you might have old bulbs or an electrical problem. Sometimes, this issue can be fixed with a simple repair or cleaning, but other times, a dim sign indicates it’s time to switch to a brighter, newer sign, like an LED replacement. If your sign is advertising services you no longer offer, it has got to go! Similarly, trendy signs that go out of style can discourage customers looking for the next new thing. If your business has changed directions, but your sign hasn’t, it’s time for a replacement. Another big red flag that a sign needs replacement is poor phrasing or grammatical errors. Problems like these will discourage customers, who might believe the company is unprofessional or low-quality. If your custom sign has a misspelling, awkward phrase, incorrect contact information, or a grammar issue, get a new sign or risk losing business. A new-looking, bright, and accurate sign can be the difference between booming business and diminishing sales. Follow these tips to know when to repair and when to completely replace your company signs.